GPS tracking collars on 102 bucks show some interesting trends in how bucks tend to move during the breeding season. If you are doing your homework, you are using scouting cameras and long range surveillance with binoculars to keep track of the bucks that live on the land where you hunt. You have a pretty good feel for the bucks that use the area. Then the rut comes along, the first three weeks in November, and suddenly, a buck appears on camera that you have never seen before. And just as odd, a couple of your bucks just seem to disappear. We’ve all wondered about this phenomenon, but now we have better insight than ever before. A paper recently published in a scientific journal entitled “Purposeful Wanderings: Mate Search Strategies of Male Whitetail Deer” details the findings from a five-year study of 102 bucks with GPS tracking collars. The position of the buck is recorded every hour, and the insights are quite revealing. Here are some of the findings. Deer are individuals and have individual traits or “personalities.” Some bucks are more homebodies and some travel over long distances. Interestingly, while all bucks participate in the search for does, the study found some bucks focused their efforts in specific areas, while others travelled more randomly. Younger bucks tended to travel more at random, covering a lot of ground with little pattern to their movements. Older bucks which have lived through three or more breeding seasons seemed to focus their efforts on specific areas. The scientists called these “focal areas.” It seems that bucks would direct much of their time at 3-4 four of these focal areas, and travel routinely between them. In many cases, they would visit these areas once a day. The more mature bucks tended to use their energy more efficiently in their search efforts than the younger bucks. This leads us to another conclusion we can draw from the study; bucks that are effective breeders have learned where the does spend their time. Because no does where collared, there is no data to show that bucks and does where in the same place at the same time. However, it can be inferred from the data on the bucks’ movements, that these focal areas were areas that the does were bedding and feeding. Does tend to be in groups of half a dozen to a dozen, and they tend to feed and bed in fairly predictable places based on environmental conditions. For example, if the weather is nasty, windy and cold, the does tend to bed in lowland with thick cover. If the weather is nicer, the does tend to bed in more open areas, such as the leeward side of a ridge where they can see in front of them and smell any danger that might approach from the rear. Bucks seemed to know where the does tended to spend the majority of their time, and that’s where they focused their search efforts. The data proved that when the does were ready to breed, the bucks settled in. At the peak of the rut, hunters have long noted that there seems to be a time when rutting activity seems to come to a screeching halt. Hunters have termed this the “lockdown phase” of the rut because of the belief that bucks and does are holed up together in breeding. The data of this study seems to validate this belief. Collared bucks that were constantly on the move suddenly stopped for 20-28 hours and remained in a small area. This corresponds with the amount of time that a doe is in peak estrus and is ready to breed. A buck that has ceased his travels for a day or so is probably in the company of the doe and breeding several times over a 25-30 hour period. Then he is on the move again. Some bucks tended to focus on one focal area. Rather than checking multiple doe areas, these bucks seemed to have found one where the does were living and just stayed there waiting for the does to come into heat, rather than running between the focal areas. Because more mature bucks tended to spend the majority of their time in the focal areas and the travel corridors between focal areas, it can be inferred that they have learned the behavior that makes them effective breeders. Rather than running helter-skelter, chasing every doe, and following every track that smells good, these mature bucks stick with their plan: Keep checking where the does live until they find one that’s ready to breed. Scrapes and rubs tend to show up in these breeding areas and on the travel corridors between them. Multiple mature bucks tended to use the same focal areas and travelled the terrain features between these areas. The data showed that 65 percent of the bucks visited the focal areas at least once per day. The data also suggests that bucks which learn effective breeding strategies pass on more genes, and increase their competitiveness during the breeding season. Could the specific strategies that work best in certain terrains and habitats become more prevalent over time? Of course that cannot be determined in a five-year study. How Can this Data Help the Hunter? If you are sitting in an area during the rut and you are not seeing any deer, you may want to move. There may be a lot of rutting activity going on a short distance away, but if you are not in one of the focal areas, you are missing out. Use scouting cameras and burn the boot leather to find where the does like to bed and keep that in mind when you are hunting during the rut. Be mobile. 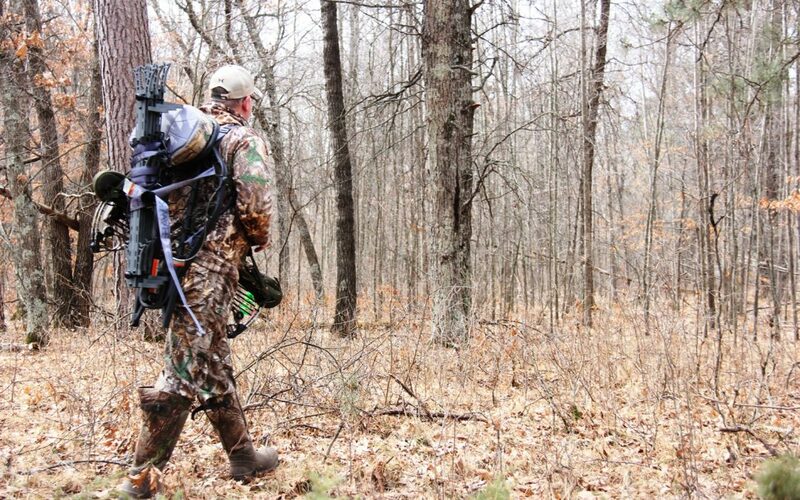 The action can be furious just over the next ridge, so use equipment that allows you to move your stand quickly and quietly when you see signs of rutting activity. Also, look for the terrain features, trails and sign such as fresh buck tracks and scrapes that indicate where the bucks are likely to be travelling between the focal areas. 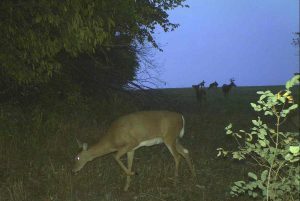 A mature buck could show up at any time on one of these trails.